Kids need room to be creative and have fun, so if you've got space in your home why not create a dedicated playroom? It can be in a basement, and extra bedroom, or even a corner of a family room. The key to decorating a playroom is to keep it simple, keep it organized, and make it a place where your kids can feel comfortable. Dividing a playroom into separate zones is a great way to help keep things organized. Have one area for messy activities, one for quiet activities, and an open area for play. The more room you have the more zones you can create. Make sure that craft zones have a table, comfortable seating, and space to spread out paints, crayons, glue, glitter, etc. It's also a very good idea to have a storage zone with shelving, bookcases or bins where everything can be put away at the end of the day. Learning how to be organized is an important life skill, so help your kids develop it early in life by creating designated storage areas for books, crafts, and games, and making sure they put their items away when they're done using them. This task is made easier with the use of baskets and boxes labeled with each child's name, or the specific items they should contain. At the end of the day, they know exactly what should go where, and they can simply dump items in the right basket. Also, keep in mind that kids respond better to rules when they're made fun. Find storage bins that are colorful and playful (ie sports themes or animal themes) to make cleaning up part of the fun. A quiet area for kids to sneak away to be on their own is a great idea in any playroom. Kids like to be able to have privacy for reading, playing with their toys, and keeping all kinds of sweet secrets, so provide them with a place where they can do so comfortably. A teepee (as pictured) is a cute way to give kids a private space while also adding some color and pattern to the room. Include a soft space to sit and some plush fabrics to make it cozy. 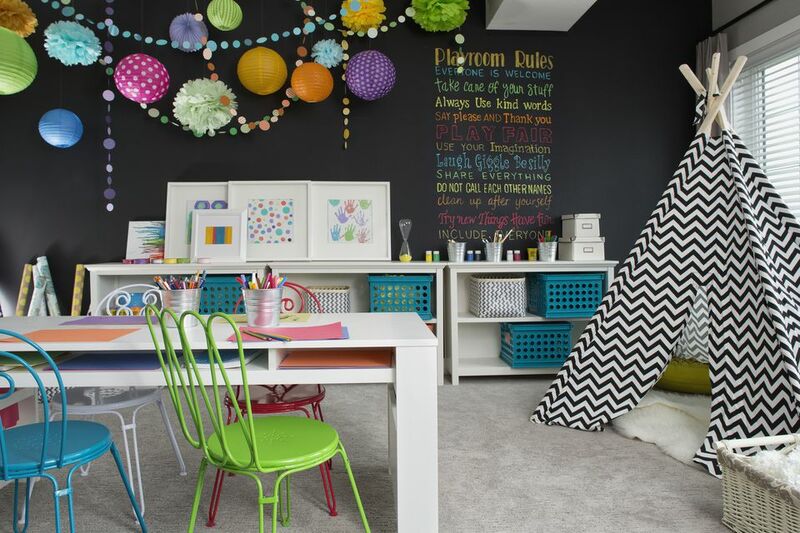 A playroom is the perfect place to go a little wild with color. Not only is it fun, but it can boost energy and creativity, making it great for a room where kids rule. This doesn't mean you have to fill it with tons of bold, primary colors if you're not into them, but don't be afraid to use different colors liberally throughout the space. And also feel free to use patterns such as polka dots and chevrons. When it comes to colors and patterns for kids' spaces there are no rules. There are a few different schools of thought when it comes to the best flooring for a playroom. Durability is certainly important, but so is comfort. If you're interested in a hard surface floor, opt for something that won't scratch or dent too easily, such as laminate, and something that has some cushioning such as cork. Consider laying an area rug over it in order to provide some warmth and comfort. If carpet is more to your liking, be aware that it likely will get dirty. Have it treated in order to make cleaning stains easier. While a chalk wall is certainly not a must, it's a fun way to give your kids a place to create. They can draw on a whim and erase it just as easily. It's also a great place to draw large-scale pictures. If traditional black or green chalkboard paint isn't to your liking you can always make a custom color by mixing paint with unsanded grout. Just make sure the kids know it's the only wall that it's ok to draw on! *A note about safety—in children's rooms it's very important to make sure that any furniture above waist height (ie bookshelves and storage units) is properly secured to the wall. Kids have a tendency to climb when trying to reach things and unsecured furniture can pose a serious risk.